If you have a craft project or home remodel, please be sure to think of the ReStore first! Donations are always welcome. The ReStore is open Wednesday through Friday from 9am to 6pm and Saturdays from 9am to 2pm. All donations are tax deductible and will then be auctioned off to raise money for Habitat for Humanity and the Magic Valley Arts Council. For all of the artists out there, shop for your supplies at the ReStore and create a masterpiece that can be donated to this great event! 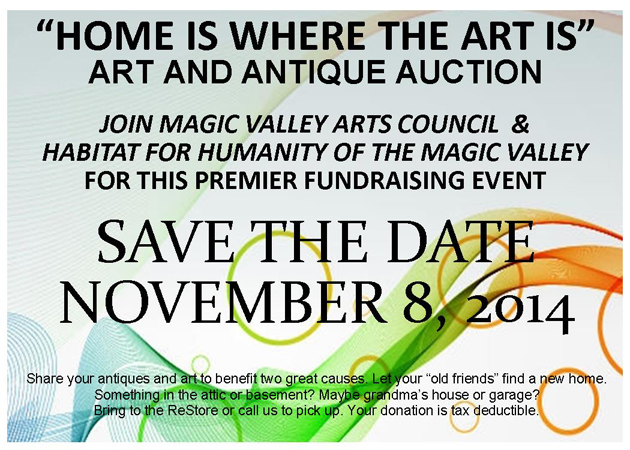 For more information about the events for Habitat for Humanity and the ReStore, go to habitatmagicvalley.org or "like" them on Facebook. Habitat for Humanity ReStore sells new and used building materials and accepts donations of hard goods, building materials, windows, plumbing materials and much more. To date, ReStore has kept over 1 million pounds of usable building material out of the local landfill! If you have a craft project or home remodel, please be sure to think of the ReStore first! Donations are always welcome.